August 1, 2013, 6:54 AM · SeaWorld Orlando opened December 15, 1973, the third theme park in the SeaWorld chain of marine parks. SeaWorld found a much more lucrative site for its next park, when it decided to open just up the road from the new Walt Disney World Magic Kingdom, two years after that park's successful debut. SeaWorld helped establish Orlando not just as yet another town with a theme park, but as a multi-park vacation destination, nearly 10 years before Disney would open its second park. Like the San Diego and Cleveland-area parks, SeaWorld Orlando debuted with a mix of animal exhibits and shows. Three years after the park opened, SeaWorld's owners sold to textbook publisher Harcourt Brace Jovanovich, but HBJ ran into financial trouble, and eventually chose to sell. That's when Busch Gardens owner Anheuser-Busch stepped in, buying the SeaWorld parks in 1989. Unlike HBJ, Busch had experience in managing animal exhibits as well as building thrill rides, and Busch used that experience to develop SeaWorld more aggressively in what was becoming a very competitive Orlando theme park market, with four Disney and two Universal theme parks today fighting for visitors' time and money. In 1992, SeaWorld Orlando joined in the simulator ride craze started by Disneyland in 1987 by introducing Mission: Bermuda Triangle, which the park later rethemed into Wild Arctic. However, with Wild Arctic, SeaWorld demonstrated the audacity to use its simulator as a preshow for a richly detailed, highly-themed exhibit of arctic animals, including polar bears and beluga whales. This established a template of combining major thrill rides with themed animal habitats in "two for one" attractions that SeaWorld parks continue to this day with newer attractions such as Manta and Antarctica. 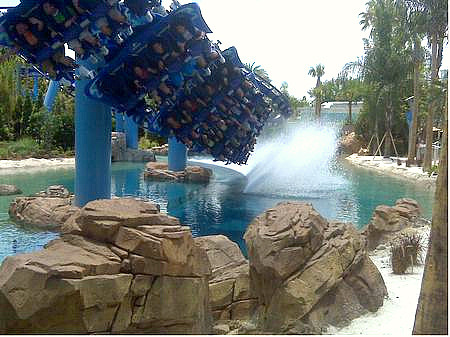 Once a show-driven park, under Busch ownership SeaWorld Orlando began bringing unique rides systems to the Orlando park, including the nation's first combination roller coaster and flume ride with Journey to Atlantis in 1997. SeaWorld also added a Bolliger & Mabillard floorless roller coaster, Kraken, in 2000 and a flying coaster, Manta, in 2009, which won the Theme Park Insider Award as the best new attraction in the world that year. In 2008, Belgian brewer InBev bought Anheuser-Busch, leading to the sale of the SeaWorld and Busch Gardens parks to a private equity firm the next year. And in 2010, SeaWorld suffered its greatest tragedy when one of the park's orcas grabbed the ponytail of a trainer, then dragged her into the water, drowning her. That led federal regulators to bar SeaWorld's trainers from performing in the water with the whales during the park's iconic "Shamu" shows, sparking a legal and public relations battle over the use of captive orcas that continues to this day. But SeaWorld has continued to develop unique attractions to supplement its shows, including a 360-degree, 3D dome theater for a movie in its TurtleTrek exhibit in 2012 and the nation's first trackless dark ride system for its Antarctica: Empire of the Penguin pavilion in 2013. Today, SeaWorld also offers Orlando visitors two other, smaller parks in addition to its eponymous marine park. Discovery Cove opened in 2000, offering up-close animal encounters in a more intimate, and pricey, setting. And in 2008, SeaWorld opened the water park Aquatica, which the company then replicated (on smaller scales) at or near the two other SeaWorld parks, in San Antonio and San Diego. Also: This isn't directly related to the history post, but SeaWorld announced this week that it is offering $50 daily tickets on weekdays to US residents for SeaWorld Orlando or Busch Gardens Tampa, starting today and running through December 20. Tickets are available on the parks websites, or by calling 888-800-5447. August 1, 2013 at 9:19 AM · $50! Wow! I was planning to visit Sea World to check out Antartica, and it will cost me much less now. I'm glad I didn't go before. August 1, 2013 at 12:03 PM · Wild Arctic was not the first simulator ride at SeaWorld Orlando. That distinction belongs to Mission: Bermuda Triangle, the first big-budget themed ride that opened in 1992 under SeaWorld's new management team from Anheuser-Busch. A little over two years later, the simulator ride closed and was rethemed and paired with an animal exhibit. It reopened in 1995 as Wild Arctic. I've been on both versions of this simulator ride and don't care for either. They're done cheaply, with substandard visuals and effects. However, as SeaWorld's first big-budget ride, it was a step in the right direction. Here's hoping the management in place now that SeaWorld is a public company will remember what made people flock to the parks when they were run by A-B (cleanliness, value, compelling shows and animal exhibits, innovative rides) and continue to pour resources into their growth and maintenance, rather than cut budgets to save money and stabilize the stock price. August 1, 2013 at 2:23 PM · I miss the free beer and the horse exhibit when Busch used to own SeaWorld. August 2, 2013 at 11:58 AM · I'd completely forgotten about Bermuda Triangle! You're right, and I've added that to the post.